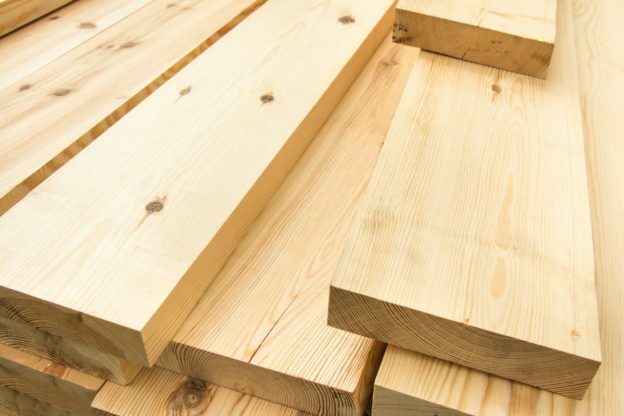 You may have seen framing lumber and softwood boards sold at your local lumber yard or hardware store advertised using dimensions that don’t match the actual size of the board. Hopefully you haven’t been burned by assuming that a 2 x 4 is actually 2 inches by 4 inches but if you have, know that you’re not alone. You might be wondering “what’s the deal?” Why is lumber advertised using dimensions that are inaccurate? Believe it or not, this is not an error at the factory or a big corporation trying to take advantage of you, and there is actually a reason for this. Most softwood lumber sold at the lumber yard is dimensional lumber. Dimensional lumber is lumber that has been dried and milled to standard dimensions and is most commonly used for framing and construction. Dimensional lumber is sold using what is referred to as the nominal dimensions of a board. These are the dimensions of the board before it’s been dried and milled. The actual sizes of a board are smaller than that. 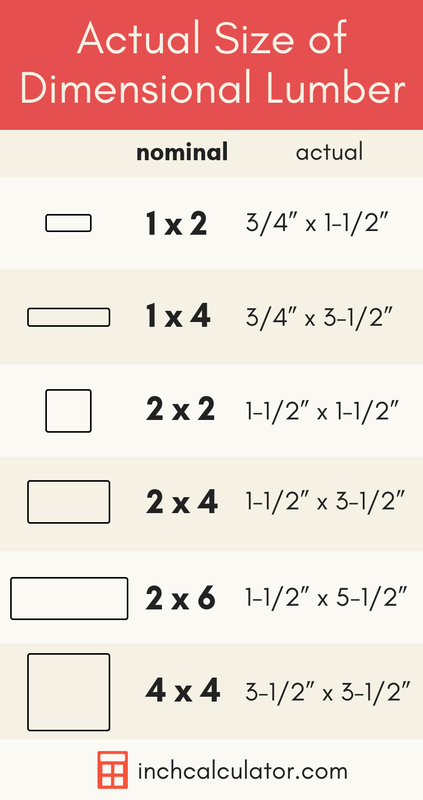 For example, a 2 x 4 board is actually 1 1/2″ x 3 1/2″. The board is advertised and sold using the nominal dimensions, which are a bit larger than the actual size. Refer to the table below to see the actual size of lumber. If you’re stuck without a tape measure or reference table you can also use a simple rule of thumb to determine the actual size of dimensional lumber. If the nominal size is smaller than 1” then the actual size is 1/4” smaller than the nominal size. If the nominal size is larger than 2” and smaller than 8” then the actual size is 1/2” smaller than the nominal size. If the nominal size is 8” or larger then the actual size of the board will be 3/4” smaller. Why is dimensional lumber smaller than the nominal dimensions? Historically, softwood logs were cut green into 2×4 but would naturally shrink as the boards dried out, and after planing and milling, they ended up around 1.5×3.5. Today, boards are intentionally cut large to allow for shrinkage during kiln drying and the milling process. Because the amount a board shrinks can vary by wood species, moisture content, and even the individual tree, the final size may vary slightly. Modern sawmills typically account for this, however, and dimensional lumber is generally pretty consistent. Hardwood lumber is sold very differently from dimensional lumber and is usually measured by the board foot. Calculating board feet can be a little tricky, but it’s essentially just a measurement of the volume of the board. Hardwood lumber is often sized by the thickness of the board, which is measured in quarters rather than inches. Quarters refer to the number of quarters of an inch of board thickness. For example, a 1” thick board is referred to as 4/4. To make things more confusing, hardwood lumber is also sold either rough sawn or surfaced on one, two, three, or all four sides. Boards that have been surfaced are referred to using the designations S1S, S2S, S3S, or S4S, depending on how many surfaces have been planed. These designations are important since they impact the actual thickness of a board. For example, a 4/4 board is 1” thick when it’s purchased rough, but is 7/8” thick after surfacing one side and is 13/16” thick after surfacing two sides. Refer to the table below to see the thicknesses of hardwood lumber that is rough or surfaced. You might also be interested in learning about the actual thickness of a sheet of plywood.